It's that time of year! The YA Crush Tourney is back for the third time, and it's going to be awesome! Some of my favorite crushes are in the tourney this year, from Augustus Waters and Etienne St. Clair to Maxon Schreave and Tobias Eaton. All the crushes and what day their tourney is, plus the bracket, can be found here. For those who don't know, the YA Crush Tourney is a tournament hosted by the YA Sisterhood that pits YA crushes up against each other, bracket-style (sorry, no mud pits!) until one comes out on top as the winner. There's lots of swoon, lots of boys, lots of fun, and you should totally participate! He's a super hot bad boy and gang member from the super steamy and amazing Perfect Chemistry series by Simone Elkeles. 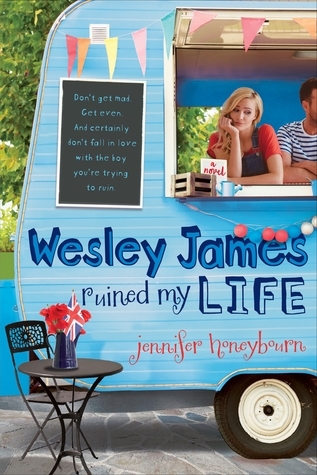 While he makes cameo appearances in the last two books, he's the star--along with Brittany Ellis--in Perfect Chemistry. Here's the info about the book! So. Alex is in the YA Crush Tourney. Now what? This is where YOU come in. This is when you absolutely lose it. Come voting day--heck, even starting now--go crazy. Go loco. (When you go crazy, please be nice--to advocates, readers, voters, authors, competition, etc. Kill them with kindness, not with blood.) Spread the word like it's the plague! Tell everyone to vote--your family, your friends, your coworkers, your enemies, your dog--everyone! All they have to do is take less than a minute to go to the website, click ALEX FUENTES, then VOTE. That's it. Remember: You can vote from your phone and Kindle and computer--wherever you can get online. (Use your library, school, and work computers!) Vote on Google Chrome, Firefox, and Internet Explorer--each one is a vote! Post about Alex on Facebook, Twitter, Tumblr, text everyone in your phone, post it on the message board at Starbucks. The more the merrier, because we, of course, want Alex to win! In the meantime, spread the word like fire! Below I have some button/graphic/icon-y thingies you can use. Post them on your blog, your Tumblr, Twitter, Facebook, make them your profile pictures, whatever! I will be making a third button, but I need your help! I want the button to include Alex's hashtag for the tourney. I don't want to do just #TeamAlex. I want something different. Maybe #FuentesGang, or #AlexsGang? Share your ideas with me! There's just one more thing I'd like from you--more help! Being an advocate for Alex, I get to write up a post about why people should vote for him. To do so, I need your help. I want to know what YOU love about Alex. Not just "he's so hot!" because we know he is. (And he really, really is.) It's kind of like blurbs on the back of a book, but about Alex. I'll pick some of my favorites and put them in the post! I think that's it, at least for now. Again, I've got buttons for you to decorate the world with, as well as a form you can fill out to join the street team and share your ideas. If you have any questions, feel free to email me, comment on this post, or tweet me. 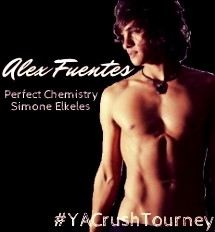 THANK YOU SO MUCH for supporting Alex Fuentes in the YA Crush Tourney! It's going to be a crazy ride! LOVING the buttons! I am sure you will do Alex proud! looks so good to me! and I enjoyed the related posts too! thanks for sharing!